5 Little Angels: Birthday Party Package Available Now at Fish & Co.
Birthday Party Package Available Now at Fish & Co.
Every kids love to celebrate their birthday with friends and having a party will made their day a special one since so many peoples celebrate with them. We can have a party at home but to avoid so much of preparations and cleanings later, many opt to have their children's birthday party outside the home. Some playlands, cafe, restaurants and fast food restaurants do provide such services with customised party as requested by the children and parents to ease the burden of the parents and to make the party as unique as possible. Mommy Jane and Little Angels were recently invited to nautical-themed adventurous Birthday Party launched by Fish & Co. at Pavilion KL. Collaborating with DayOne event team, both of the work together to bring amazing fun and excitement for our kids' party. We started with a scrumptious buffet meal prepared by Fish & Co. The food was yummy and love by children and adults. Our favourite which include Fish & Chips, Nuggets, squids, Coleslaws, Spaghetti etc. Butter and chocolate cake as desserts were served to all the media and bloggers with our little ones. We were also served with their refreshing ice tea, coke and sprite. There are 2 types of utensils that cater for adults and children. Adults could use the Fish & Co. famous pan as their plates while children could use the colourful plates, bowls, cups and even folk and spoon. This attracts them to eat more and enjoy each and every of their food taken. After our meal, kids were brought to an exclusive play area to start the main agenda of the evening. Fish & Co. had turned all our kids into little sailors who were tasked to assist the host of the evening, Captain Savannah to search for the hidden treasures on Momentous Island ! Once the party area was opened, Little Sailors were divided into 2 groups. First group is to operate each game or food stall and another group were given a bag to collect as many gold coins as possible. To get the gold coins, Little Sailors have to complete each task successful. They hopped from one booth to another. 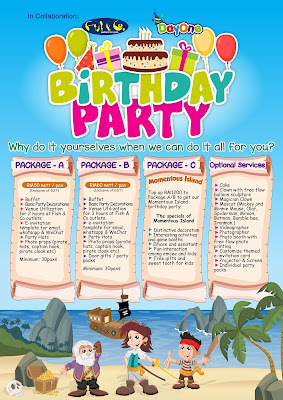 Fish & Co. organises birthday parties according to your budget for children of all ages. They have a professional and passionate team who enjoys hustle and bustle of creating and pulling together an event. They can do everything for you from choosing suitable venue which near you, catering, theme, budget, stuffing, menus to momentous, they had a dedicated team who delivers uncompromising service and attention to detail. They take pride in taking a wholly unique and personalised approach to present a truly momentous celebration for your precious one. 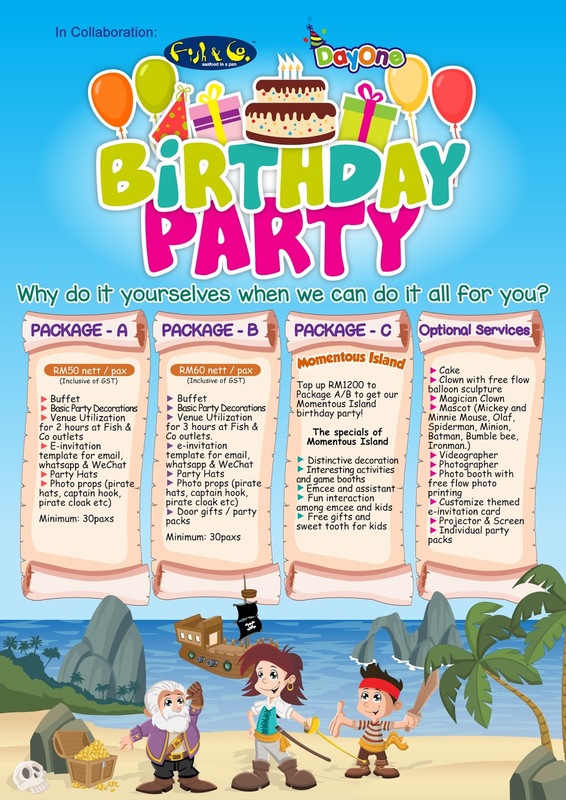 Birthday Party Package for kids is available at Fish & Co. outlets located at Pavilion KL, Main Place @ USJ 21, Paradigm Mall, IOI City Mall and The Mines Shopping Mall. For more details, you could visit their website at www.fish-co.com.my or follow their facebook page at www.facebook.com/fishncomy, twitter at www.twitter.com/fishncomy or instagram at www.instagram.com/fishncomy for latest news. For booking queries, please contact Charmaine at 0123873291 (charmaine@fish-co.com.my) or Zoe at 016-2017367 (zoe@fish-co.com.my). Thanks to Fish & Co. for having me and my Little Angels to their nautical-themed adventurous Birthday party. My Little Sailors had so much fun hopping from game booths, hands-on booths, photo booths to the dessert counter in search for the hidden treasures on Momentous Island. They enjoyed their yummlicious food too using the colourful utensils specially for them. Adults and children love the place so much coz' it was spacious and a family-friendly restaurant which is simply perfect for all sorts of party. Shet Ling, nice to meet you there too. Truly an enjoyable event for kids and adults. Wow such a nice event for the parents and children. Have fun. Kelly, thanks. My children really love all the games at each and every booth there. Love nautical themed parties! Looks fun! Hanniz, really fun for kids. Mommy and Daddy do play along too. Arisa, a great place to hold a party for the kids. It is spacious, food was delicious and nice decorations too. Ayue, indeed it is. More choices and better celebration. looks all your photos ,I think all the kids have a very good & fun time ! Adzlin, they had so much fun time there. Everything was well-planned to ensure each and every kids enjoy themselves. Rawlins, indeed it is with fun games too. Purchase A 14K Gold Cuban Links Online.